We had an excellent trainer for CSM. The course was well-planned and organized. The study material, activities, and discussions were insightful and provided an overview of the experiences and expectations in the real world. The capital of France, Paris is undoubtedly the most beautiful city in the world. It is also a hub of commerce and trade with immense opportunities for employment. With the city being so rich in culture and heritage, the benefits of pursuing the CSD certification in Paris becomes multi-fold. Paris is a beautiful, serene and promising city to start your career with the coaching provided by KnowledgeHut. The workshop has been divided into lectures and practice sessions that span over a duration of 5 days. While the first day of CSD training in Paris will begin with introduction to the basics, the next day will have the tutor give you solid material on the electives. 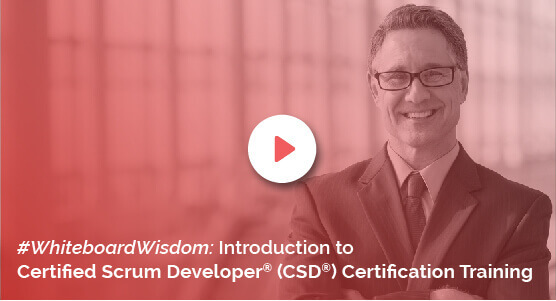 On the third and fourth day of certified scrum developer certification in Paris, your trainer will give you demo on the technical track and you will get a hold of Scrum tools through e-learning and hands-on training. On the final day of CSD course in Paris, you will be given a detailed recap on everything that has been taught in the previous days. The benefits you can avail when you enrol yourself for the certified scrum developer training in Paris with KnowledgeHut Academy are many. Apart from the PDUs and SEUs upon completion of the training and the 2-year membership with the Scrum Alliance, we also provide you 100 days free access to our Agile and Scrum e-learning programme. KnowledgeHut is a globally acknowledged academy which is known for providing training to its trainees at a very nominal fee structure, which is inclusive of the Scrum Alliance Certification Examination fee. We aim to provide the Certified Scrum Developer certification in Paris that will give you an unparalleled experience.